As Table Rock nears the magic lake level of 918 feet, we all wait with baited breath to see if the U.S. Corps of Army Engineers is going to change its generation patterns. Will they start running less water? Shutting it off at night? We will see very soon. Generation has been constant with two units running in the mornings, increasing to three units mid-afternoon, then back down to two units after dark and through the night. Today, it did slow down a bit with less than two units generating this morning. Remember, some of the gates at Powersite are down, so the Corps can't keep the water totally off during the dam until Empire repairs the gates. Bull Shoals is down to 685.17 feet, just a little over five feet short of the mark where Powersite can be worked on. It's taking about three days for Bull Shoals to drop a foot right now. Trout fishing this past weekend was pretty good for most. Anglers fishing below Fall Creek did well drifting night crawlers on the bottom from the creek mouth down to Trout Hollow. Phil Stone, fishing guide, said his clients did well from Cooper Creek down to Monkey Island on crawlers. 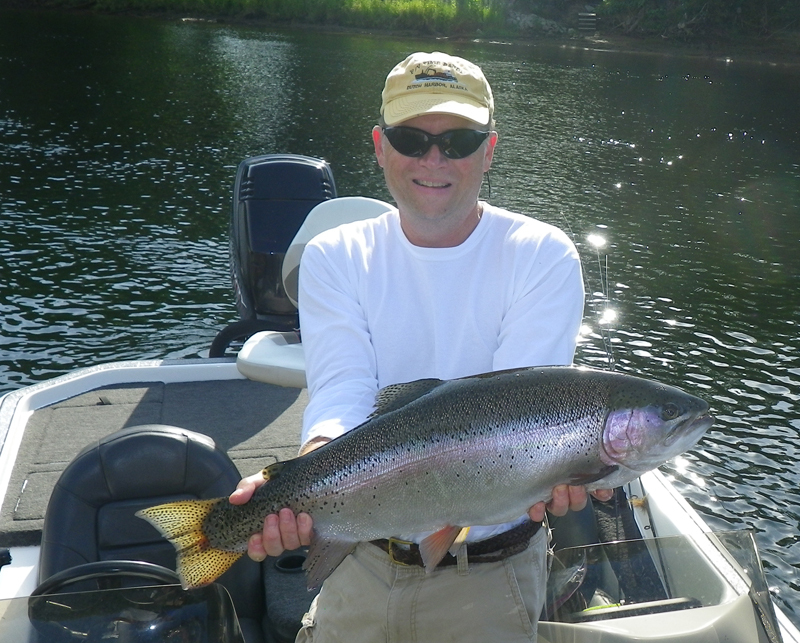 Everyone is still catching a few brown trout, but nothing longer than 20 inches was landed. Guide Tony Weldele's clients caught some nice rainbows and browns drifting from Fall Creek down to Short Creek using pink and red San Juan worms. I've gotten out and drifted #14 gray scuds in the same stretch and caught trout, too. If you didn't see the story, Morgan Wyatt, a young woman who started working for us here at Lilleys' Landing in April, caught this 10.5 pound brown on a #14 gray scud drifting about 500 yards above our dock a week ago Sunday. It's amazing a fish as big as this would take a bug as small as a #14 scud, but it did. The trophy area is still producing good numbers of trout. For fly fishing, present a dry fly along the banks, close to or under trees, and you might see some great top-water action. Hoppers in various colors and sizes, beetles, ants, Stimulators, Elk Hair Caddis and a Sofa Pillow are good choices to throw. Stripping a big streamer along the bluff banks above and below Fall Creek will create some attention, too. You'll get a lot of chasers with a hookup occasionally. When the water is running about 50 megawatts or about 704-705 feet, fish a bigger beaded fly, like a beaded scud or a Miracle Fly (egg) or even a small jig under a float with a red Zebra Midge dropper, about 12 inches below the first fly. Fish it from four- to seven-feet deep. We watched some guys fish this rig last week along the bluff across from the resort and they caught fish. I think you can use it just about anywhere, but the water has to be running fairly slowly. If the water is running more than two units, you could go further down lake, say, from well below Cooper down through the bridges. Throwing marabou jigs has been slow for me personally but I've seen and heard others doing well. Travis Smith and friends fished last week and reported doing very well throwing white 1/8th ounce jigs from the cable below the dam down to Trophy Run when the water was running more than 3 units. They used darker jigs if the water was running less than 3 units. Tom Burckhardt, St Charles, MO., caught this six-pound brown on an 1/8th ounce sculpin marabou jig down lake from the resort (secret location) last Saturday during the Guns & Hoses Trout Tournament. He and his partner, Bill Freise, won the contest. The September forecast is looking good. We've had some rains but nothing to affect the area lake levels, so we should see less and less generation through the fall months. As soon as Powersite Dam is fixed, we will start seeing mornings when the water is not running at all, may be a little water in the afternoon or evenings. But keep in mind, Beaver Lake is still very high and the Corps will at some point start lowering Beaver into Table Rock Lake. Of course, all that water has to flow through Taneycomo. 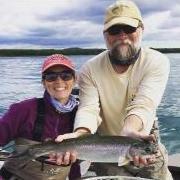 I believe our dry fly bite will continue well into October, which is exciting to fly fishing enthusiasts. We are already seeing some big brown staging in the Fall Creek area. The average size of our browns have increased from last fall, so I think we'll see quite a few brown near or topping the 20-inch mark. The fall brown spawning run should continue into November, peaking about the last week in October.